October. Months ago now. My wife and I spent most of it driving around England, from London, to Bodmin in Cornwall, to Aberfoyle in Scotland, to York, to Brighton, and back to London to fly home. We based ourselves in each locale — sharing with fellow Aussie travellers in Cornwall and Scotland in self-catering cottages — and did day trips to the surrounding sights, except for Brighton, where we were ensconced for the World Fantasy Convention. 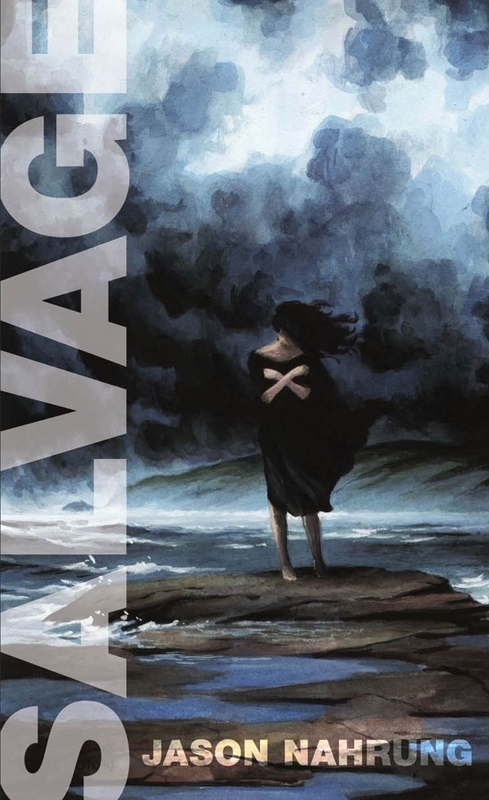 Much has been said elsewhere about the convention (start here, if you like): I enjoyed it, but programming let the side down, and the numbers were huge, so it didn’t really feel like a World Fantasy, more like a Worldcon. Anyway, it will be the last one for me for awhile. Got this holiday to pay off, yeah? The British Museum: Perfect for a rainy day — and you do need all day — and how wonderful to reconnect with the wonderful Sekhmet statues in the Egyptian section. It’s free, though a donation is requested. I gave at the gift shop. The Thames: we made the most of the sunshine and hopped a boat to Greenwich, where we roamed the market, checked out GMT and enjoyed the skyline from the river. Borough Market: my friend Tina tipped us off to this one, where all manner of tempting goodies were to be had. We bought cheese, not as rank as the Stinking Bishop we’d had previously with my friend Maria down the pub. Highgate Cemetery: I love this cemetery. Douglas Adams is buried there, amongst many other luminaries, and much undergrowth. Galleries: London’s got oodles. We hit the National Portrait Gallery — Brontes! Shelleys! Helena Bonham Carter! — and the Tate Modern — Picasso and stuff, a bit more challenging, but a wonderful space and plenty to consider; there must be something for everyone in here. A show! What, with the West End right there, you’d be mad not to take in a show, right? The Leicester Square TKTS booth is first port of call to see what’s going hot and cheap. We snaffled two in the slightly downbeat, quite intimate and absolutely wonderful Fortune Theatre for The Woman in Black — some very creepy staging, a few too many cheap loud noises, and an uncompromising ghost story. Just as enjoyable as when I first saw it, all those years ago, but I don’t recall those sound effects. A room full of schoolkids matching the cast scream for scream certainly helped the atmosphere! 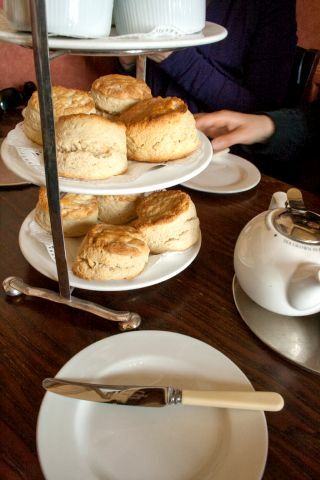 Twas Cornwall where we had our first Devonshire, or cream, tea, and somewhere between there and Devon we worked out the best possible combination: CLOTTED cream, lashings of strawberry jam, warm scone. And yes, for those pagans among us, coffee ‘if we must’. Tintagel: a most scenic ruin spread across mainland and island, fantastic, and that’s without bringing King Arthur’s conception into it. A nearby Norman church is worth the walk. 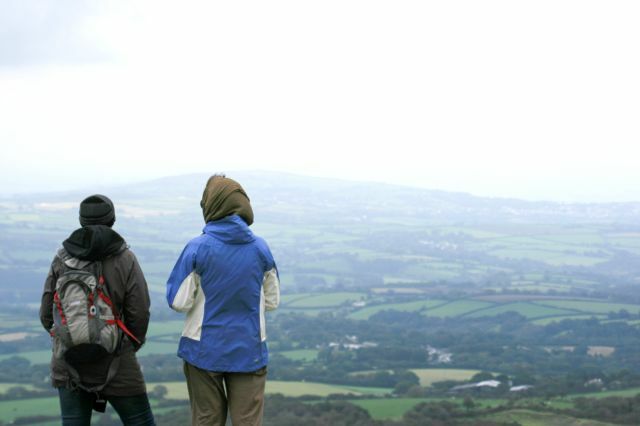 Bodmin Moor: Winding roads cross this undulating landscape, windswept and all camouflage-coloured in heath and blackberry vines, dotted with standing stones and the remnants of tin-mining glory. What a contrast, the stones and the ventilation shafts that dot the countryside, and now with added wind farms. Dartmoor: not Corwnwall, but Devon, but an easy enough drive and thoroughly rewarding — oak forests, Iron Age settlements, standing stones, wild ponies, scrumpy. And everywhere — everywhere — sheep, and some cattle, including some big-horned shaggy ones. Pretty villages, but horrid streets: Street? Ha. Lane. Alley. Oversized footpath! Clinging to sea cliffs, places such as St Ives, Port Isaac and Fowey are delights for the pedestrian, and boast some of the best fish and chips I’ve ever had (highly recommended: the King’s Arms in Marazion, near St Michael’s Mount, and what a cool place that is, with the tide coming in over the causeway so you get a boat trip back to the mainland). A note on Land’s End: it might be the southernmost tip of the country, and the coffee might be half decent, but it’s really not worth paying the price of admission to this capitalising theme park. More pleasing was an ice cream from the van near Godrevy Island lighthouse and watching the sun set. We took a night in Bowness-on-Windermere on the way north from Bodmin to Aberfoyle, and wow, the Lakes District sure is pretty. Mountains, rivers … lakes, naturally. Well worth a return for some serious tramping. The Three Sisters (Glencoe): We drove from Aberfoyle up the western side of Loch Lomond to Loch Ness. What a brilliant drive. Lochs, mountains, moors … lochs, did I mention lochs? Gorgeous with their borders of autumn forests. Trossachs: Aberfoyle, on Loch Ard, is a gateway to the Trossachs park, and we spent a day tramping two routes to get a good look at the mossy forests and reflective lochs. More lochs. Oh yes! Awesome lunchtime destination, loch-side: Venachar Lochside cafe near Callander. Glasgow Necropolis: Sprawling, hilly, treed, this epic graveyard is a time sink with its many memento moris and statues. Old Calton Cemetery, Edinburgh: Last time I visited, I bumped into the grumpy Scots in Edinburgh and came away unimpressed. This time, I’m prepared to give the old place a second chance, even if driving in felt a little like being caught in a computer game with vanishing lanes, narrow lanes, parked cars, one-way streets, invincible pedestrians and trams. The small Old Calton Cemetery, across from high-point Calton Hill with its faux-Parthenon National Monument, is well worth a browse, with many tombs set against the walls and fine carvings. But it’s the haggis — brilliantly spiced and lightly deep fried, at the so very friendly Royal McGregor on the Royal Mile, that really wins me over to the place. Stirling: I love this town, especially the old area around the cemetery and castle. Such a picturesque resting place with some lovely decorative stones, under the eye of the castle. 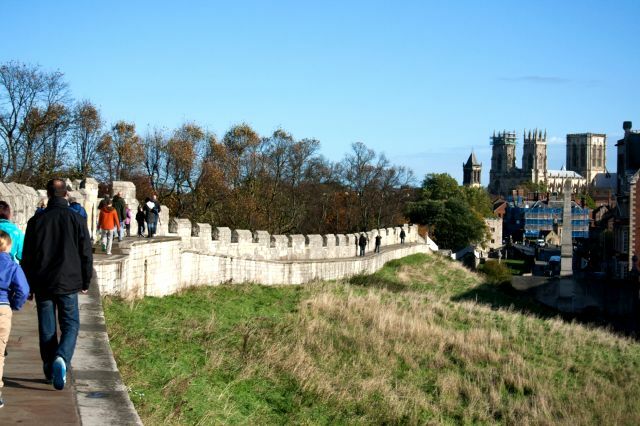 York is one of my favourite English cities, mainly because of the Shambles and the layers of history to be found there. We could easily have stayed longer in our charming Gillygate B&B (Kirstyn loved her morning kippers! ), just outside Bootham Bar and within chiming distance of the Minster. York Castle Museum was worth the price of admission just for its recreation of a Victorian street that cycles through a full day with light and sound, and the haunted house on Stonegate Street was interesting just for its architecture. Great food (try the Hole in the Wall pub for Yorkshire pudding, the Evil Eye Lounge for spicier Malaysian fare), bar one pub who will remain nameless; a walking tour guided by cat statues; a clever, well-acted play (Can’t Stand Up for Falling Down) at the York Theatre Royal; and Roman ruins and walls EVERYWHERE (even in the theatre!)! We took a day trip across the moors to Whitby, such a charming fishing village that I first encountered in the pages of Dracula. Given its Whitby Gothic Weekend tradition, I’d expected more goth stuff, but no, not really, and we missed the kitschy Dracula Experience (so bad we had to see it, we were told by friends, but we got distracted by the abbey). 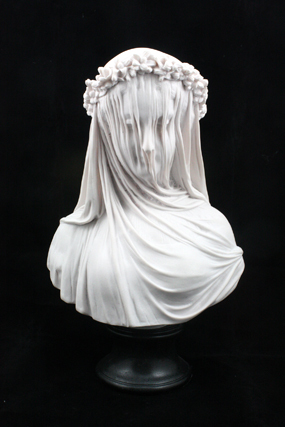 On the West Cliff, Captain Cook — there’s more to him than we get taught in school — and our prize acquisition from this holiday, a gorgeous ‘Veiled Bride’ sculpture reproduction bust of a veiled vestal virgin. 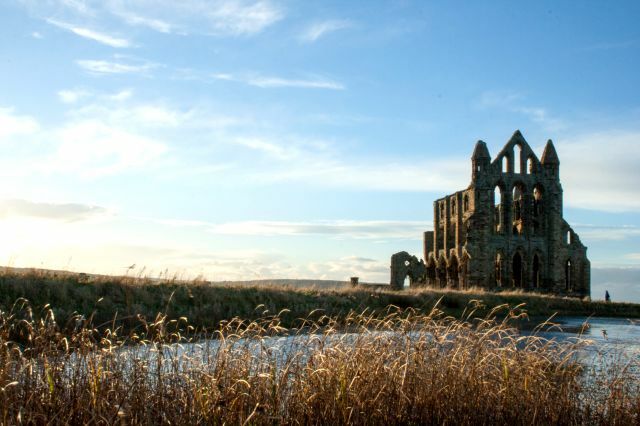 On the eastern side of the river, a little shambles, the 199 Steps to the top where St Mary’s church and the ruins of St Hild’s, or simply Whitby, Abbey await. The abbey is stunning, and we watched the sun set there. Awesome fish and chips for lunch? Try Royal Fisheries. The great thing about the English weather forecasts — while their news, and TV in general, is fairly crap, the weather forecast you can rely on, so when they say clearing in the arvo, you can safely leave York with the wipers on and watch the sun go down at Whitby. 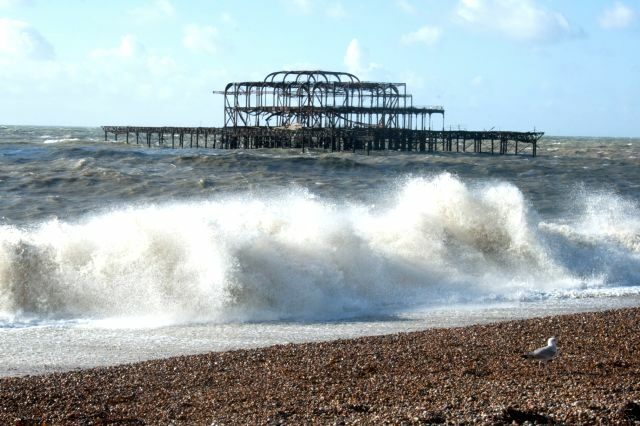 Didn’t get much of a look at Brighton, other than its pebble beach — what a funky racket when the waves are crashing in! — and its famed pier and a bunch of lunches and dinners. Probably the best night out was at Little Bay, set up as a kind of theatre with one booth sporting a cameo of Edgar Allan Poe, jazzy operatic singer Sam Chara, and a 10-quid three-course meal that was worth a whole lot more. A bus trip from Brighton to London for 5 quid! Score! And then, a last dinner at an Italian place called Bizzaro, near Paddington Station, with tiramisu to die for. 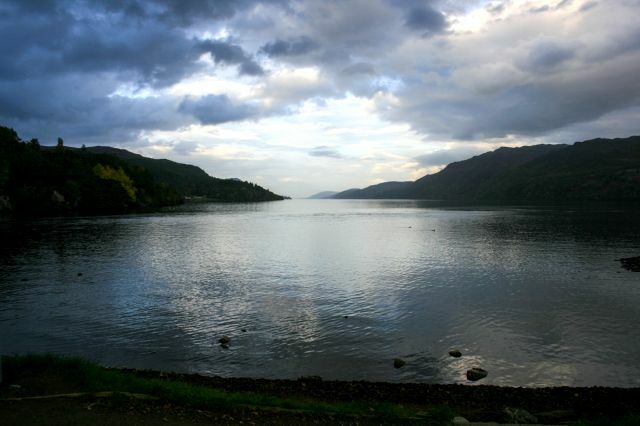 This entry was posted in travel and tagged aberfoyle, cornwall, edinburgh, glasgow, holiday, loch ness, necropolis, scotland, stirling, three sisters, tintagel, whitby, world fantasy convention. Bookmark the permalink. I have to show this to Alison. She did this trip last year and would concur with your lanes comment. Last one for a while, but yes, good to get up into Scotland this time! Did you get to go to Eilean Donan?